The 360 degree carp fishing rig is designed to give greater freedom of movement. It can easily rotate 360 degrees, hence its name, and this gives it much more flexibility. Any rig with a large amount of freedom from all angles seems to improve the hooking ability. 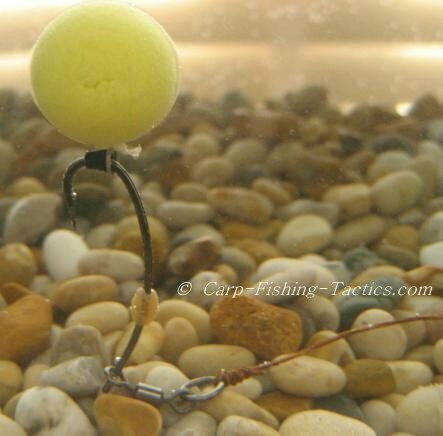 The 360 degree rig helps increase the chances of a good hook hold no matter which side a carp approaches the bait, or at what angle it is sucked into the mouth. 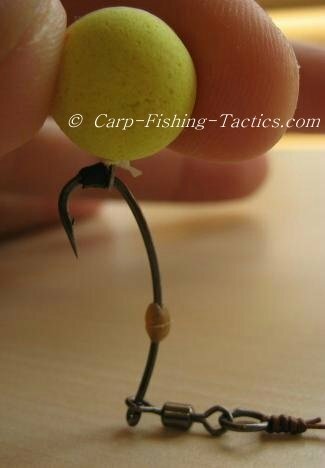 The flexibility of the whole rig allows the hook point to turn and drop very quickly to grab a hold of the flesh. This means that more carp can be hooked, even those that feed very cautiously. 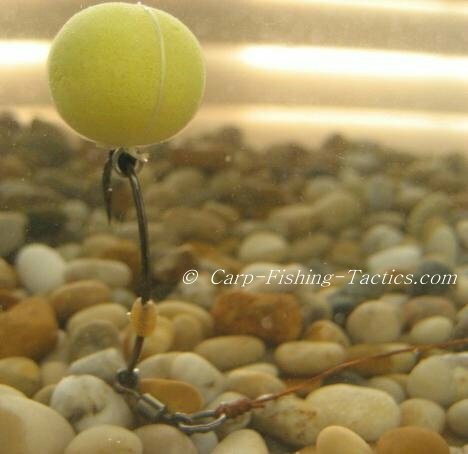 The rig must be used with a pop-up bait, as this will cause it to sit correctly as shown in the pictures below. You can get the most out of the 360 degree rig by making sure it sinks slowly, so it rests lightly on the bottom. 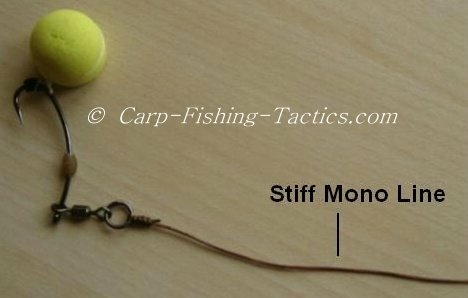 The stiff mono line boom section allows the hook to fall away from the lead so it presents the bait well. I find this fishing rig works well when it lays nicely onto a soft silt bed, or lake onto a bed which has bits of debris and leaves. On these beds it wont look too much out of place. It could be used in weed, but I feel that the stiff boom may get tangled amongst, or in between, any weed stalks. I would suggest using the 360 degree rig when the carp in your water are hard to catch! The 360 degree rigs are only supposed to be used with pop ups. It should sink slowly and rest on bottom of lake bed under the weight of the hook and swivel. 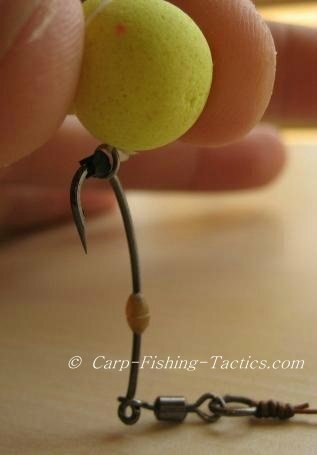 Try not to use putty on the bottom of the hook, doing so may effect the freedom of rotation. I use a nailer type hook, and thread on a swivel as shown above. 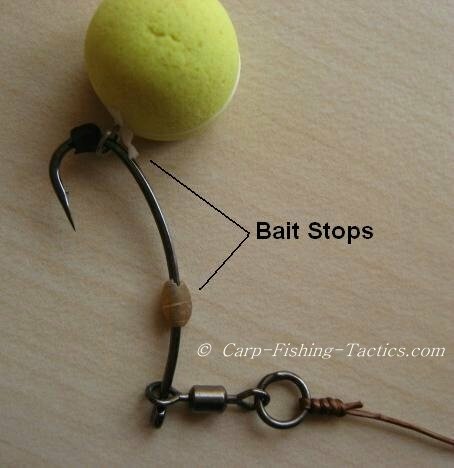 Then slide on a float stop, a rig ring, then another float stop to trap the ring. I often colour the float stops using marker pens to match the bed I'm fishing on. It is probably best to use this fishing rig with a stiff link material from the lead. This allows the hook to swing away from the lead as the bait slowly sinks, giving the maximum distance from the lead. 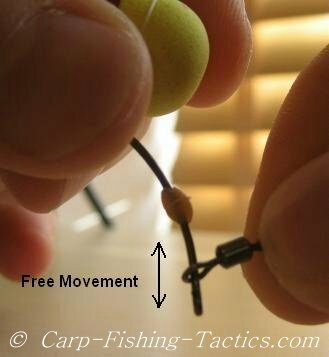 This also helps in hooking better when a fish takes it, as the rig is direct to the lead weight as soon as the bait is picked up. As the picture above shows, the 360 rig can move in 3 different ways; the hook can turn through 360 degrees, the swivel can move up and down on the shank, and the hook link can move a little back and forth. The bait also has a blow-back system for if a carp tries to blow the bait back out of the mouth. the combination of all these features makes the 360 degree rig hard to eject. The weight of the swivel can also help in the hooking, it pulls the hook point down towards the bottom of the lip to enable it to grab hold. Notice the free movement of the swivel? Although I don't really use this rig on gravel bars, the pictures show it on gravel but this is only for illustration purposes! It is important for the rig to sink slowly so the hook eye rests gently on the lake bed, for this reason it should be checked in a pot of water before casting out. The weight and the freedom of the heavy swivel causes the hook link to sink down on the bottom - another great benefit of the 360 degree fishing rig. I generally prefer to use advanced carp rigs on waters that have heavy angling pressure!